Friday Favorites: Couples and Organizing, Sentimental Clutter, Downsizing + more! Hi friends, it’s Friday again! Whoot, I love Friday. Tonight I’ll have three extra kids overnight while a friend and her husband have a nice out together. I’m excited for them and we’ll have our own fun here especially since it’s pizza party Friday night which the kids love. What are your plans for this weekend? Don’t forget to make some time for organizing! Need more inspiration? Check out my Pinterest page. 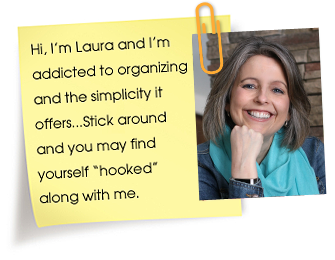 Visit Laura (Organizing Junkie)’s profile on Pinterest. Also if you didn’t grab these beautiful free watercolor printables for spring that I shared earlier this week, you can do that right HERE. 6 Responses to Friday Favorites: Couples and Organizing, Sentimental Clutter, Downsizing + more! You’re welcome Emily! I have extra laundry baskets that I use just for decluttering, great post! So nice to meet you in blog land. This is a perfect complement to my 18 Tips post – and I just may link to a few more of these great articles in the related posts section. I appreciate the feature –and I love your blog! Thanks for the linky love! Always thrilled when you take part in the Professional Organizers Blog Carnival!